It seems like all Nordic countries and other European countries included, regard sausage eating as a big deal. In Sweden, it is huge and if you should drop in on a random family dinner, the odds are they will be tucking into some form of sausage. On the streets, they have special kiosks that sell all kinds of sausages with a myriad of toppings from which to choose. Just ask anyone where to find “korv” (street food) and they will say, “Turn left and right and see they are everywhere”. 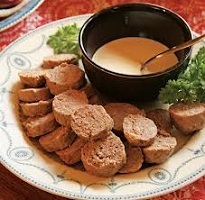 The Swedish population has been eating sausage, including potato sasauge, since the time of the Vikings. In those days, they would hide bits of meat that did not look so appetizing. Less desirable meat was thus stored in pig stomach or sometimes even the womb lining was used. Today the small intestines are used to stuff meat and to make delectable sausages. It was at the World Fair in 1897 that the Swedish took their sausage to the streets. They were first introduced by korvmadamer (women who sold sausages). The women would have sausage boxes suspended from their necks as they walked around selling the food. These potato sausages were kept warm by laying them in water and heating them up from below with a small flame. Soon the korvmadamer was replaced by the korvgubbar (sausage men). As people become more aware of the affects of bad hygiene, a sausage stall replaced the korvgubbar. The first korvkiosk opened in 1954 in the Solna district. The Swedes love the festive season and will start preparing for the celebration months in advance. They would start baking cookies, fermenting fish, drying out various meats and of course making special Swedish potato sausage for the occasion. It is an age-old tradition that when you make or buy your Swedish Potato Sausage, that you have enough to pass around to friends and family members. So, one can imagine how much potato sausage is passed around during Christmas in Sweden. One would think that it must take a truckload of flavorings and spices to make such a special Swedish sausage. However, it does not need many ingredients and naturally, you can adapt the recipe to suit your own taste preferences. The sausage itself only requires onions, black pepper, all spice, potatoes, boneless beef and boneless pork, water and some salt to taste. All the ingredients are mixed and pushed through a grinder. The mixture is then stuffed into pig casings to make one long sausage. It is then gently cooked in water for about 20 minutes and frozen in the same water, in freezer bags. On Christmas Eve, they are defrosted and prepared in time for the potato sausage feast the next day.